An EarthBox creates a contained/isolated environment for growing herbs and edibles. I have only two of them in addition to my in-ground edible garden. One of my Earthboxes has tomatoes growing in it for fall. 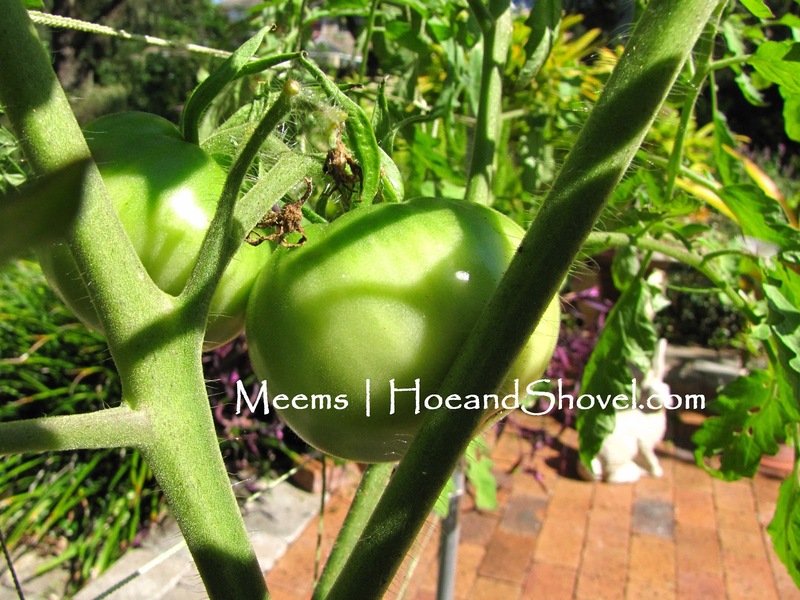 I planted seedlings 9.2.12 and tomatoes are forming on happy, healthy plants! I've attached the extension rods you can add to an Earthbox and also a mesh net that towers about 7'. The net is especially helpful in bracing up vigorous vines. This week I cleaned out the second one (it was home all spring/summer to Rue herb that hosted dozens of black swallowtail) and I planted basil starts (sweet and purple). 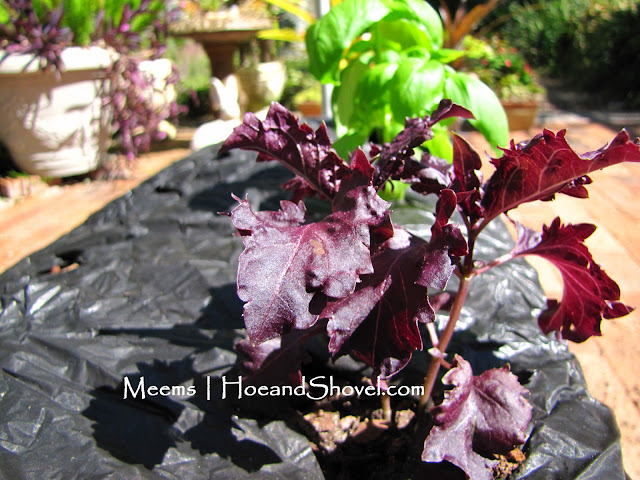 In the same box I also planted a row of lettuce and spinach *seeds* . I switch out my Earthboxes with new plants/seeds for each growing season. I always remove all the *old/used* soil, wash the container thoroughly and replace the soil medium/lime/fertilizer with fresh ingredients. Various containers can be turned into a well-draining pot for edibles. It doesn't have to be an Earthbox, of course. It's just easier for me to purchase them because they are ready to go. I like the idea of easy set-up. My experience with them has been successful. I keep mine on the back open patio where it's easy for me to water them every 3-4 days. Do you plant your edibles in containers? *** If you haven't already ... click over to Hoe and Shovel on Facebook to see the daily plants/flowers photos and discussions. Click on the LIKE button under the header to be part of the conversation. Would love to hear your opinions. Great way to grow edibles. I grow a few herbs in containers. I'm new to vegetable gardening and always like to learn about new techniques. I'd like to experiment and try some vegetables in containers next spring. I've had great luck growing veggies and herbs in Earthboxes. I am already harvesting tomatoes and have cauliflower and broccoli growing. I also keep two boxes just for herbs. This summer I moved them into partial shade and was rewarded with sweet basil, lime Basil, thyme and sage through the hottest months. Oh, how I wish I had room to grow veggies. Rather, I wish they wouldn't die on me! Naturally, yours are fantastic. Oh, BTW, I nominated you for the Beautiful Blogger Award. I did that because I think yours really is a beautiful and beautifully done blog. Check out my blog to see what the rules are. Hope you don't mind.